We'd been invited to give parents' views about a new report out today, highlighting the struggle of mainstream schools in England to support more than million pupils with special educational needs or disabilities (SEND) amidst delays to assessments, insufficient budgets and cuts to local authorities. School leaders are calling for a greater focus on SEND in ‘mainstream’ education policy-making. The report is from The Key, an organisation that provides leadership and management support to almost half of schools in England. The findings, based on the views of more than 1,100 school leaders, reveal far-reaching and systemic issues in the support currently available to children with SEND. More than eight in 10 (82%) schools across the country say they have insufficient funding and budget to adequately provide for their pupils with SEND. Almost nine in 10 (89%) school leaders have seen the support they receive for these children affected detrimentally by cuts to local authorities’ (LAs’) services. More than eight in 10 (82%) mainstream schools across England say they do not have sufficient funding and budget to adequately provide for pupils with SEND. Almost nine in 10 (89%) school leaders believe cuts to local authorities’ services have had a detrimental impact on the support their school receives for pupils with SEND. Three-quarters (75%) of schools have pupils who have been waiting longer than the expected maximum six weeks to hear if they will get a statutory assessment for an Education, Health and Care Plan (EHCP). Almost nine in 10 (88%) school leaders think initial teacher training does not adequately prepare teachers to support pupils with SEND. None of this is news to us - we only have to look at last week's EHCP figures to see these failings in the government's own figures. It's not even as if we didn't see it coming - what else can you expect when you rush a far-reaching piece of legislation into practice a day after the final Code of Practice is published? When asked if initial teacher training adequately prepares teachers to support pupils with SEND, almost nine in 10 (88%) school leaders said they don’t believe it does. They will, no doubt be pleased to hear last week's announcement that training for teaching children with autism is to become a core element of ITT. The only question is why has it taken so bloody long? If the government wants mainstream school to be inclusive and for every teacher to be a teacher of children with SEND, then they have to train teachers in how to teach every child in their class, whatever their needs. And guess what - that's going to cost more money too. But The Key report shows that even with that, teachers are not convinced inclusion works, quoting one headteacher as saying, “Teachers cannot possibly have or expect to gain knowledge, experience and skills to cope with the many differing needs of children now coming into school”. And as for Academy schools, well we all know what they think of children with SEND, just ask Melanie Sykes. It seems that primary schools are under the most strain with 84% of primary school leaders saying their budget is insufficient and 91% have had the support they receive for SEND provision affected by cuts to their LA. Meanwhile, in Secondary, 70% of Secondary school leaders are concerned about their SEND budget with over 81% saying their funding has been cut. Delays in assessments of SEN and long waits for education, health and care plans also appear to be more prevalent for children of primary-school age. Almost eight in 10 (79%) primary schools have pupils who have been waiting longer than the expected time, alongside just over six in 10 (62%) secondary schools. From Monday 6th June 2016, (my birthday! ?) The Key will be running a #SENDmatters campaign to raise awareness, drive positive outcomes and make a difference for children with SEND. 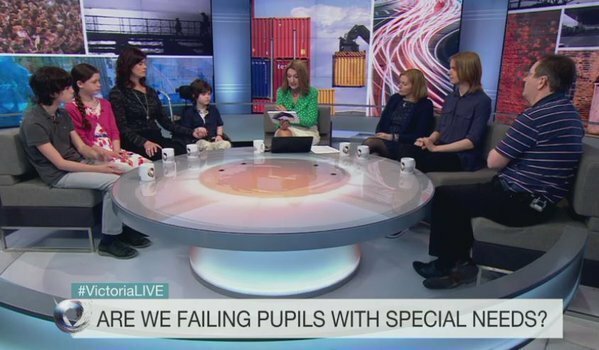 If you miss us on Victoria Derbyshire, it will be on iPlayer afterwards and I'll try to add the link here. Just hope you don't have a big-screen HD television - don't want to scare the kids! Please do add your comments below. Tell all about the smoke and mirrors processes that spend our children’s sen support funds on financial sweeteners for schools, to enable them to accommodate the work involved in Herts home grown SEND funding distribution process! Tel about government guidance and laws on funding specific statement/ehcp provision – these apply in Herts too. Tell about the multi-layers of ‘clusters’ and ‘panels’ making opaque and inconsistent decisions based not on need and actual provision already defined by what should have been a thorough assessed EHC plan ( if the LA has done it’s job properly). BUT. INSTEAD. Based on the competency of this round’s schools to make a case for the funding of Johnny’s provision in Herts. Ask why, if law says statement/ehcp provision must be arranged by the LA, the LA invented a funding distribution process just fire Herts children, by which schools bid for only some of the provision their children need and are entitled too. Ask why schools have to decide which children’s provision will go unfunded, which horse they will back to secure most funding. Tell them this Herts concoction discriminates against moderately disabled children because they know moderate provision won’t win the x-factor type whittling out process. Won’t secure funding. Tell them that busy Herts schools are made to compete in a blind auction (lottery!) against other schools, each trying to win the necessary funding for their extraordinary children. Their disabled stars. Yet all these stars deserve to shine; the moderate stars too should be equally funded. And equally wanted, not discouraged from joining a school which thinks the moderate child is not disabled star enough to get any funding. Tell them that all these schools deserve to be facilitated and funded to do their jobs, to arrive for the best possible outcomes for every individual in the classroom. Not just some! Tell them that Children that are so extraordinary as have already been assessed by HCC to need to high levels of help, should not need to prove the need for funding all over! Well, their schools shouldn’t need to anyway. It’s expensive and time consuming and probably illegal. It’s grossly unfair. Tell them about losers that will be left empty handed, sometimes only finding out months later, after passing cluster stage one earlier in term, that they didn’t clear the later LA decision panel anyway. This secondary panel can override (quality controls decisions) cluster decisions as it sees fit. Despite in many cases there being a statement/ehcp of need and a law which says LA must make and find the stated provision to meet that need. Tell them about the rationing based on what’s left in the funding pot (after paying for the bureaucracy). Tell them about provision which discriminates based on funding, not needs, and provides for the few with the very highest needs and the most capable combatent schools to fight their cause. Tell them that this years SEND X-Factor Herts winner could be next year’s looser (X!) such are the inconsistencies. The needs, competence of schools in this ‘bidding war’ and funding available change each year. If a school is successful in supporting progress, then funding required to achieve that may be cut.Any child awarded this year/phase, may not be successful next time. How can schools plan? Tell them that schools/parents can’t defend against this if LA has declined a statutory and binding EHCP ‘because these are no longer required to access funding’. Or because in Herts, any plan offered, did not specify (in quantity or type) the provision such as actual support hours as is required in law. And if the LA say this way is quicker, ‘parents don’t need an EHCP too secure funding’..remind them how right they are. They EHCp counts for nothing in this process; even with one, funding is not automatically forthcoming as it must be. What about the child waiting all year, school not keen to apply for EHCP, finally passed stage one local cluster in term 3, but now waiting on stage two panel decision….no date yet available for this. And no help yet in June! Any award likely to be for September…may be. May be not. Ask them, how does a school plan? How does a parent sleep? How does a child thrive? Ask them, how much of the HCC budget did they spend on provision and how much of their budget was spent on systems and planning to deliver savings and preserve jobs of an LA swollen with SEND managers that have the time to invent this stuff? Ask them, how do they sleep? Good luck both! Sat by the TV, preparing to be very scared.